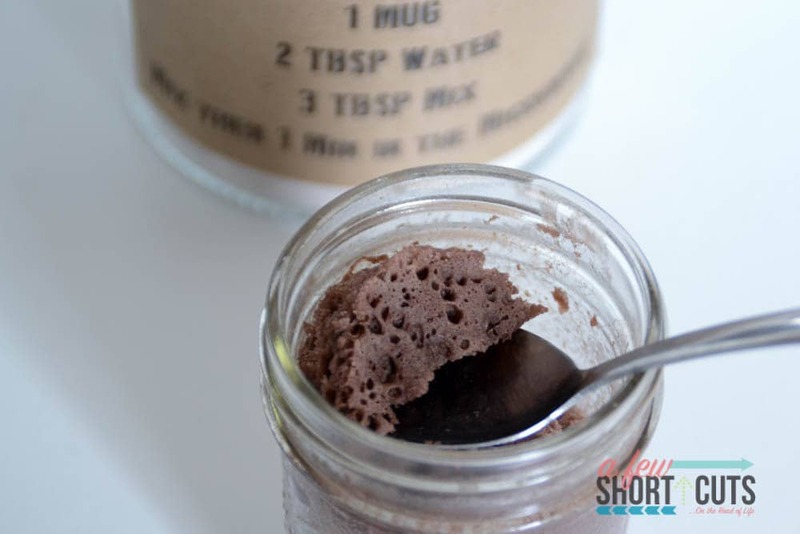 You need to make this Chocolate Mug Cake Mix Recipe to have on hand in case of emergency plus get the Free Printable Labels too! Such a great homemade gift idea too! There are a few things in my house that could trigger an emergency response. Of course, if there was the obvious fire, injury, intruder, etc. Then there is the less obvious. Like the lack of chocolate based food products….especially after the kids are in bed and I don’t have to share! Not an emergency you say?! Ha, check out the definition! There you have it, folks, a lack of chocolate is totally an emergency! Luckily I have a secret weapon for just a situation! 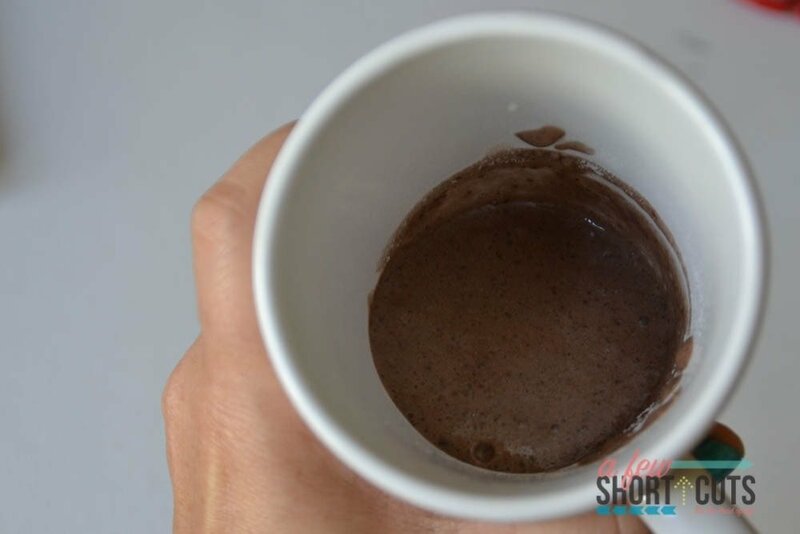 This Chocolate Mug Cake Mix Recipe! 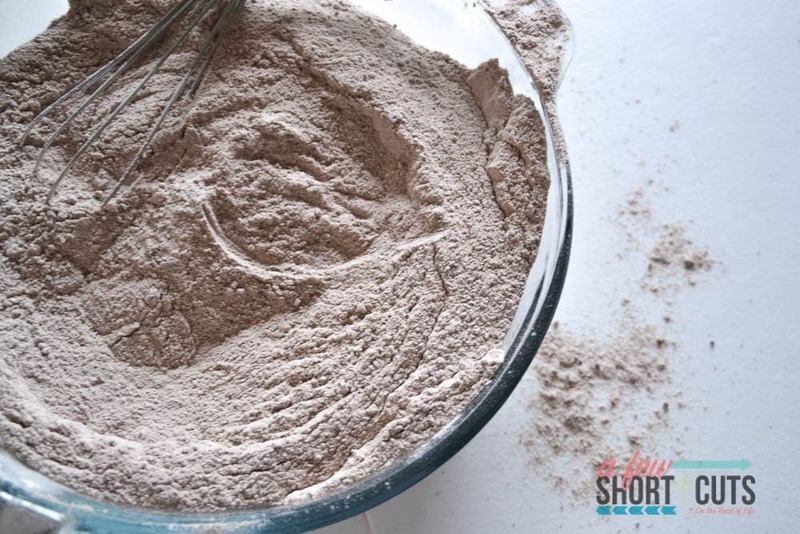 So simple, so genius, and I can have a hot chocolate cake in my hands in 1 minute flat! That sounds like a lifesaver for me! 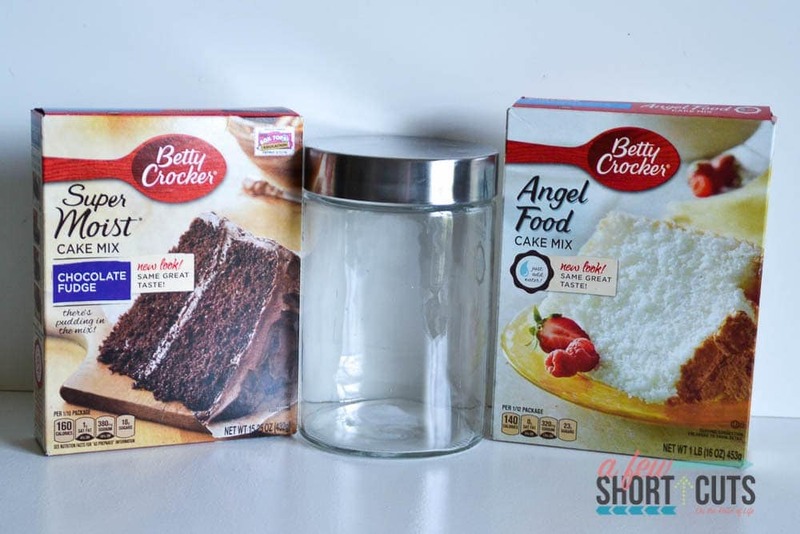 You are going to need a chocolate cake mix, angel food cake mix and a jar big enough to hold both. Mix both cake-mixes together very well. 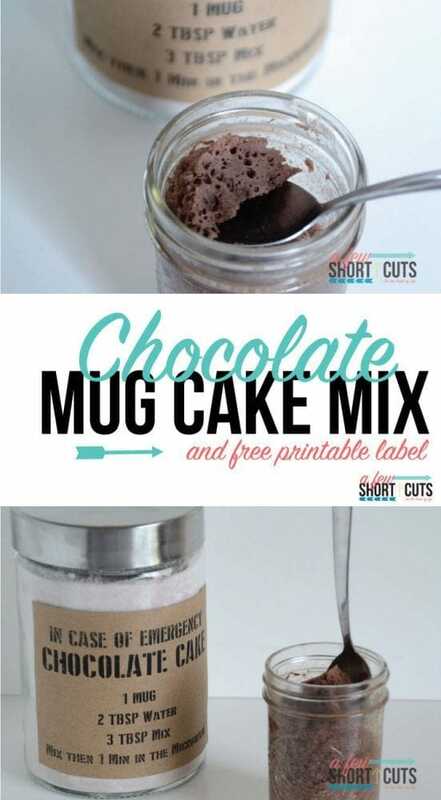 Put 3 Tbsp of the cake mix mixture into a mug, or mason jar. Add 2 Tbsp of water and stir. Pop into the microwave for 1 minute on high. What you get is nothing short of genius. It is like a chocolate angel food heaven. Now if you drizzle a little caramel topping over it…OMG!!! Also good with whipped cream and a few strawberries. It is just good by itself too! It’s chocolate! Then there, of course, is the rest of the mix. Put it in that jar and then label it. So you are ready to go In Case of Emergency! 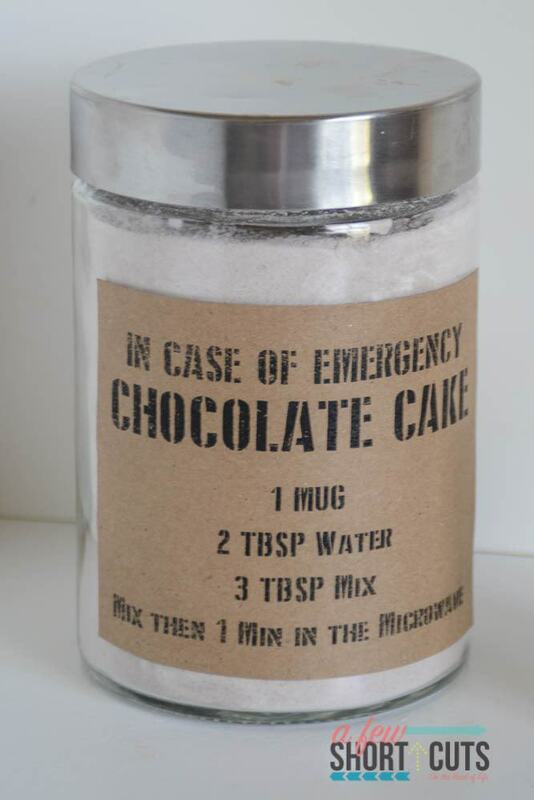 You can also print these super cute “IN CASE OF EMERGENCY CHOCOLATE CAKE LABELS” out here for FREE. I printed them on this Brown Kraft Paper label, but you can print them on anything that you want. They print out 4 to a sheet so great for gift giving! The jar of the mix would make such a fun gift with an adorable mug and a tablespoon! Thoroughly mix both cake-mixes together. Store in an airtight container. 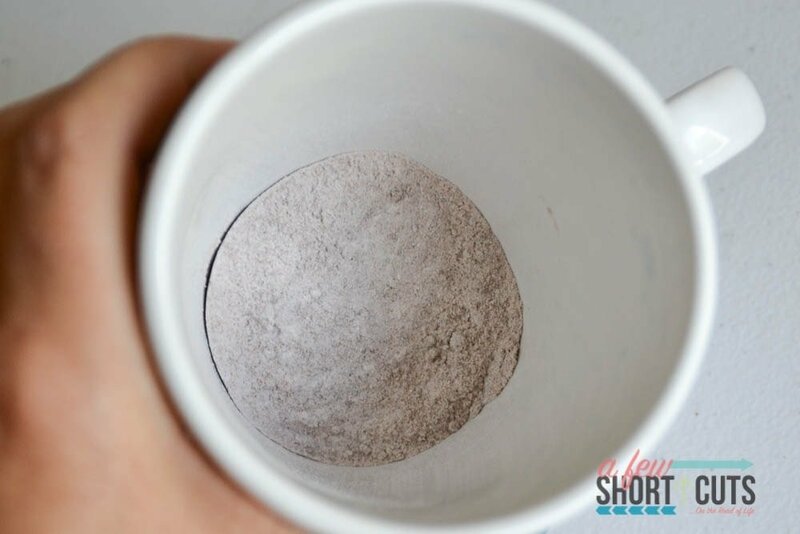 Mix 3 Tbsp of the mix with 2 tbsp of water inside a mug. Microwave on high for 1 minute. Cool & Serve. I have made this for years — it’s great. Before zapping in the micro, I add one heaping teaspoon of the pre-made Jello chocolate pudding (from the little cups in the dairy section of the store). Then microwave for 1 minute. Delicious. 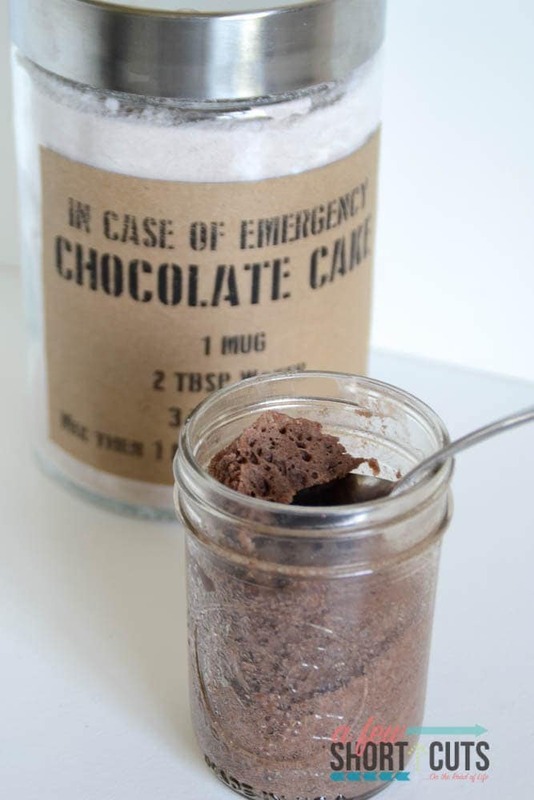 We call this 3-2-1 cake and you right, it is PERFECT for chocolate emergencies! 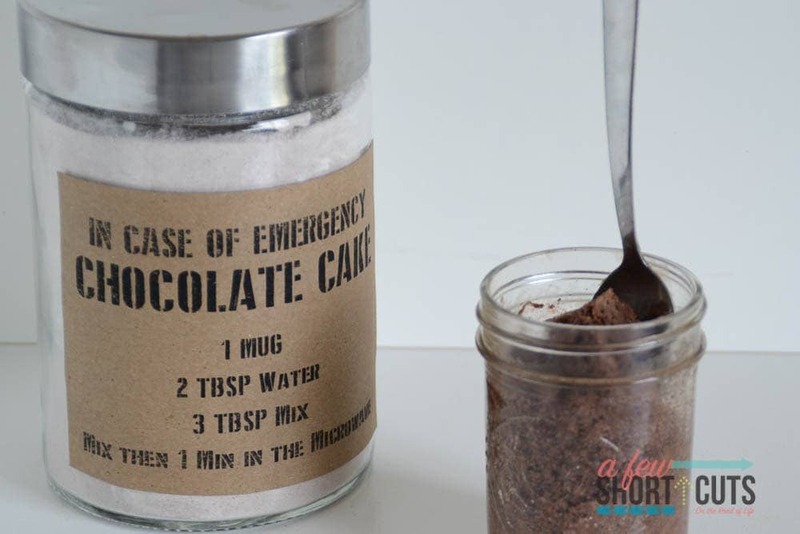 Your labels are adorable and would look so cute on an easy to make gift of emergency chocolate cake! 🙂 I have used add-ins to turn my mix into things like pina colada cake and molten lava cake. Thanks for sharing!